We recently launched a simple program to help our supporters give in a way that makes them feel connected to the horses they are helping and enjoy themselves in the process! 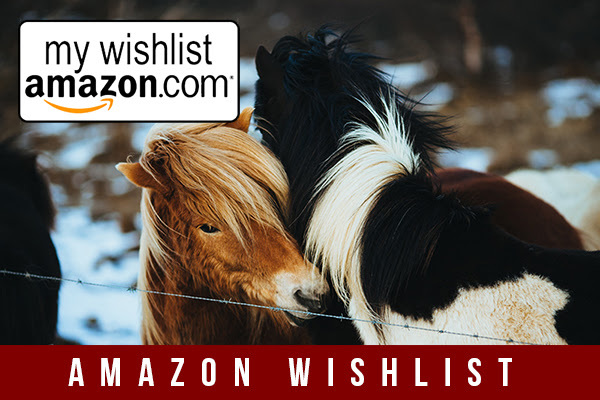 Every Wednesday, via social media, we post a new wish from our horses and a link to our Amazon Wish List. Here, you are able to look through our wish list and choose how you want to support us. We have all kinds of items listed, including grooming brushes and fly masks, jolly balls and salt licks and even much-needed veterinary equipment. If you are feeling playful, purchase a jolly ball. if you are feeling practical, you can buy a horse a weather blanket. The best part is, after enjoying picking out your generous gift for the horses, Amazon will ship it directly to us! No muss, no fuss. Another aspect of Wishlist Wednesday that makes it special, is the range of items and prices, starting from under $10. Every gift helps us provide the kind of care we believe all horses deserve. Thank you to all our supporters who have already participated in this program and to all the others who have supported us along the way.